If two heads are better than one, then four arms are probably more useful than two. But as Laurel and Hardy repeatedly demonstrated, coordination can be an issue -- especially if the task at hand entails carrying heavy equipment over uncharted terrain. Coordinating robots is also tricky, but is potentially very useful. Networked robots could accomplish more than they could individually by coordinating their actions and by sharing sensors and computing power. 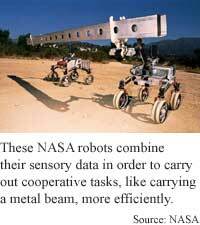 Researchers at NASA have demonstrated that a pair of networked rovers can work together to move large objects, drill holes and pitch tents in tight coordination. And they can carry out the tasks in an unstructured outdoor environment. The robots’ capability for handling and transporting large objects could be used in space exploration, the military, and in manufacturing, said Paul Schenker, the supervisor of the Mechanical & Robotics Technologies Group at NASA's Jet Propulsion Laboratory. Each robot is about 3 feet tall, 2 feet wide and 1 foot deep and weighs around 20 pounds. Each robot has four wheels and a 27-inch gripping arm with which it can lift, grasp, and move objects. It also carries instruments that measure the surrounding terrain and its position; these include visual, kinematics and acceleration sensors. The robots’ software maps the terrain they tread and guides their shared responses. The rovers avoid obstacles “by developing local visual three-dimensional terrain maps and cooperatively planning a drive-around… strategy, changing their formation and steering as needed,” Schenker said. The robots react in real time to their physical position and the weight of their payloads, he said. Sensors help them maintain an accurate estimate of their position and visually track objects. The system’s intelligence is evenly distributed between a pair of robots. Information about the terrain, their payload, positions and speeds is fused into a shared estimate, he said. Two robots can carry an 8-foot long beam for 50 meters without faltering because they are constantly aware of each other’s state, said Schenker. The actions are fully autonomous, he said. "Control is a true team decision process, mediated by various negotiation-decision strategies." The underlying behavior-based control software is fairly general, said Schenker. "It can be extended to incorporate many robots, as well as readily augmented with new skills [and] behaviors," he said. The results of this work are quite significant, said Reid Simmons, a senior research computer scientist at Carnegie Melon University’s Robotics Institute. "The work has great potential for future multi-rover outposts." "While others, including ourselves, have looked at close coordination between multiple robots in a distributed setting… this is the first such effort to operate in natural terrain," Simmons said. Operating the robots in a natural setting “adds complexities in terms of deciding what to do, and how to coordinate behavior to both achieve the task and avoid obstacles,” he said. This makes it applicable for more than just space exploration, he said. The researchers plan to further develop the robots' fused sensing, said Schenker. They also plan to increase the robots’ cooperative control and task-planning functions, and evaluate them in realistic outdoor experimental settings, he said. “We expect some of the related technologies, particularly the behavior-based functions for rough terrain navigation, to be used in the next 3 to 5 years,” Schenker said. A robot outpost on Mars, for which the networked robot crews were developed, will take much longer to come to fruition, he said. Schenker’s research colleagues were Terry L. Huntsberger, Paolo Pirjanian, and Eric T. Baumgartner. The research was funded by NASA. Related Elements: Technical paper, "Planetary Rover Developments Supporting Mars Science, Sample Return And Future Human-Robotic Colonization," published in the proceedings of the IEEE 10th International Conference on Advanced Robotics, Budapest, Hungary, August 22-25, 2001.